Barbarian or no, even Conan would fall back to a dagger if it was his only option. Learn from this example and fall back on the Silver Conan the Barbarian Dagger by Marto, as this licensed reproduction will not be anything close to a disappointment. This dagger is simple in its design, with a sort of barbaric directness that one would expect from a barbarian culture. 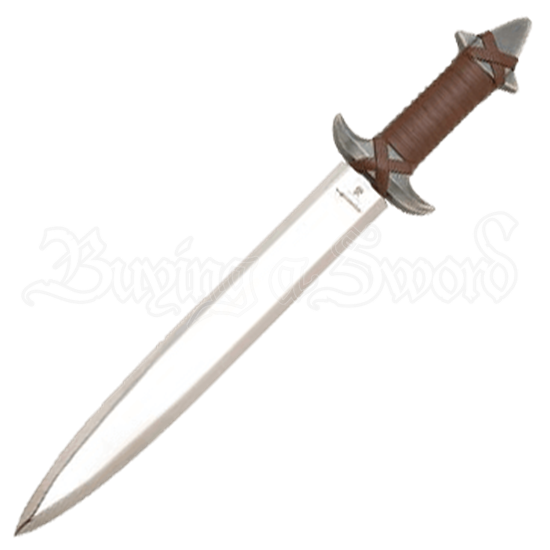 Elegantly simple in its design, this dagger is a short blade attached to a silver grip wrapped in leather. The guard is two winglets that flare out from the grip, while the pommel is an arrow-like shape that is designed for both function and use. Simple, rugged, and effective, these are three words that perfectly describe the Silver Conan the Barbarian Dagger by Marto.